Alfred “Tuna” Snider, UVM’s beloved debate team director and an international legend in the arena of academic argument, died on December 11, 2015. 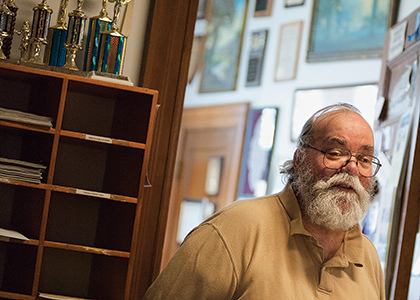 Snider, who was the Edwin W. Lawrence Professor of Forensics, led the university’s Lawrence Debate Union for more than three decades and took the student team to international acclaim. Since 1984, he served as director of the World Debate Institute. A consummate wordsmith in every format, Snider also loved music and served as the faculty advisor for the campus radio station, WRUV. In addition to his many debate and persuasion courses at UVM, he taught the popular course “The Rhetoric of Reggae Music.” Read more about Professor Snider and his work with debate in this recent Vermont Quarterly article: go.uvm.edu/tuna. "Part of my job is helping students realize that when you stand up and speak up, you can make a difference. You can become a powerful agent for social change."